Nevertheless, I had a great time with the Butterflies on the Christmas Gathering Party and received decent gifts from Secret Santa too! Whoever you are, thank you for the lovely gift! This is the first review for the stuffs I've received from the Christmas Gathering Party. There will be more reviews coming up so brace yourself! Embrace the wall of text from me! Some of you might came to know Shizens when a beautician walks up to you and offer a test on the best selling products. These beauticians will normally stand near to the Shizens counter and holding a lip product with them. You might find them annoying but if you give them a little time to try on Shizens products, you will find some interesting products from Shizens. Shizens is not a new brand in the Malaysian market. In fact, Shizens can be found in most shopping centres such as Pavilion, Mid Valley, IOI City Mall and etc. It is a skin care and cosmetic brand that offers products with natural ingredients. Besides, Shizens is a local Malaysian brand that gives premium skin care benefits to the consumers. Let's talk a little on the Lip Tattoo that I've received from the Christmas Gathering .This is one of the best selling products by Shizens and has similar functions as the Lip Painter. Lip Tattoo relieves the formation of fine lines and helps to lighten the dark pigmented lips, turning them into a pair of lips with rosy tone shade. The secret behind of the magic is the ingredients used by the Lip Tattoo. The Lip Tattoo is infused with Vitamin C and collagen production properties which will minimize the fine lines and gives a plumper look on the lips. The transparent tube has an elegant design with a shiny cover and logo imprinted on it. The white liquid filled up the transparent tube, adding on a classy feel on the packaging. Overall, I like its simple design but not the squarish tube design. Here is the close-up of the brush. 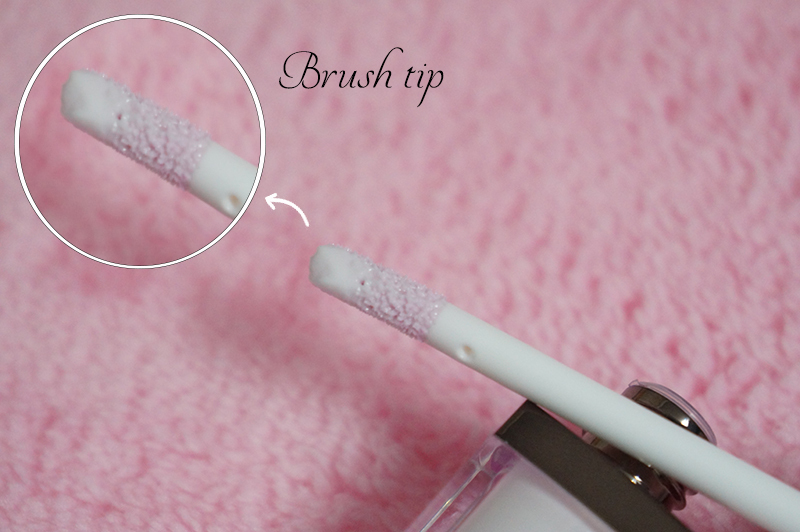 Though the brush do not have a pointy tip like a normal lip brush, it still gives a precise application. The brush glides easily on the lips it is advisable to apply on the lips every morning and after meal to keep the rosy tones on the lips. The mechanism of Lip Tattoo is simple: Spread the white liquid on the lips and wala! You will have a pair of lip with rosy tones. You can use it as a blush too! Spread two dots of the Lip Tattoo on the cheek and spread the white liquid evenly to get a healthy pink shade on your cheek. 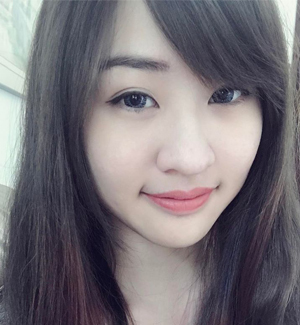 Lip Tattoo is a white liquid that will turn into a rosy pink shade after expose to the air. The time taken to turn the white liquid into pink shade depends on the amount being put on the skin. After spreading off the liquid, a pink shade appears on the hand with slight glossy finish. 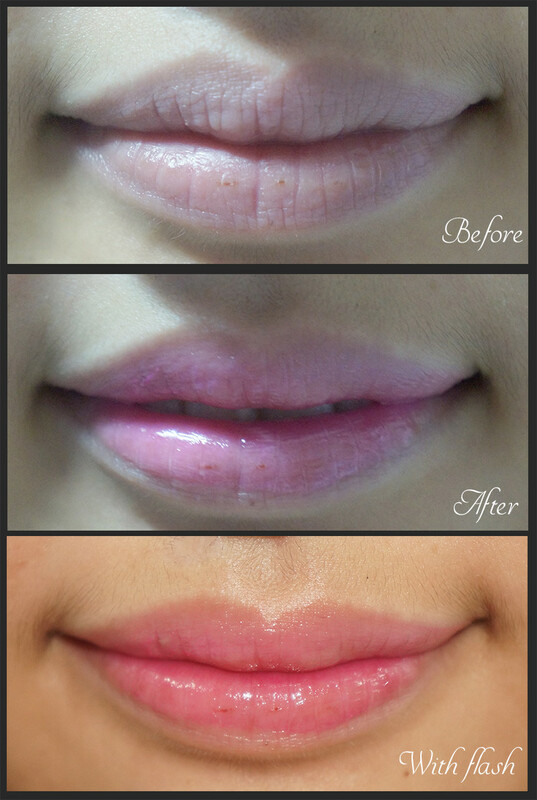 Here is an image of before and after applying the Lip Tattoo. The first two images were taken under room lighting without flash while the last image was taken under room lighting with flash. At the first image, my lips were appeared to be pale and dry. Wrinkles can be seen clearly and the lips definitely need some hint of colors to look healthier. After applying the Lip Tattoo for about 5 seconds, a hint of pink shade was formed on the lips. The lips also had a glossy finish and the fine lines were decreased gradually. The pink shade on the lips lasted for about 3 hours and a retouch is needed for more consistent rosy shade on the lips. The end result of applying the Lip Tattoo might be different on others as it depends on the original shade of your lips. The redder lips might have redder shade on the lips. 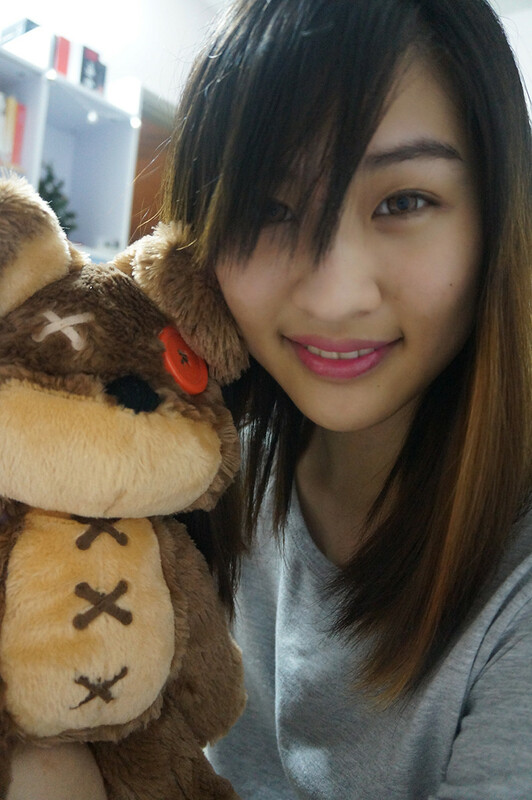 As usual, ending my post with a wefie of me and Tibbers. Lip Tattoo does its magic by turning my pale lips into rosy tones and gives a shine on the lips, as if my lips are wearing lip gloss. I've been wearing this Lip Tattoo since the first day I have it and I'm loving the natural rosy tone on my lips. It looks natural and I need not to worry if there's any smudge around my lips area. It is a little pricey as a lip product but if you do not like the greasy feeling and would like to have a healthier look on daily make up, this can be an investment for you as it is long lasting and pigmented as a lip tint.